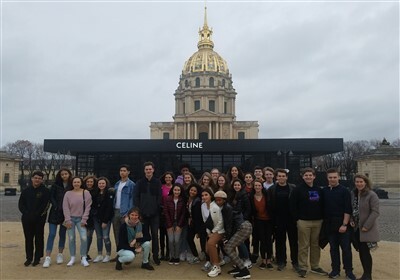 Over spring break, 26 students and 3 brave chaperones took a whirlwind tour of Paris, Barcelona, and Madrid. After arriving in Paris, the group met their tour guide at the airport. She was impressed with how lightly our students had packed! At her suggestion, the group grabbed a quick sandwich from the nearest shop, hopped on the metro, and spent the afternoon touring the Musee D’Orsay, an impressionist art museum. They attended the evening vigil Mass at the Madeleine followed by dinner in the church's crypt, courtesy of a gracious American pastor. 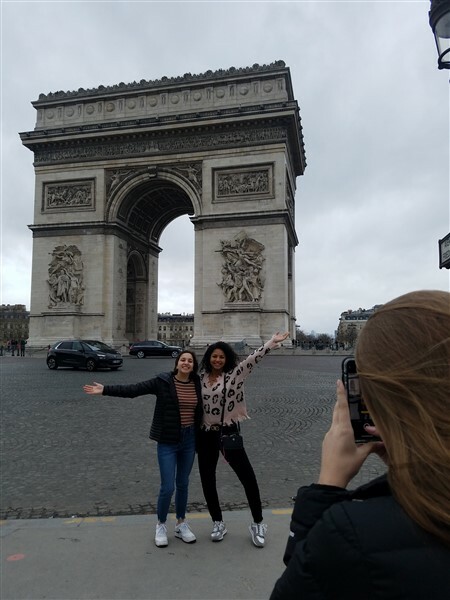 The next morning was spent touring Paris by bus, hitting key monuments like the Eiffel Tower and Arc de Triomphe, and ending at the Cathedral of Notre Dame. After lunch near the cathedral, chaperones split the students into teams. 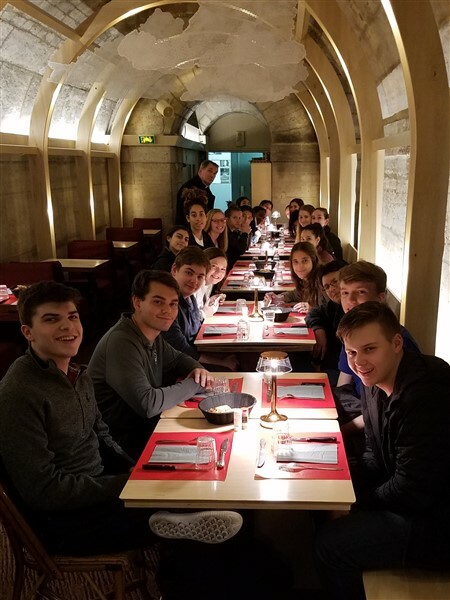 Some toured Paris by boat ride, others finally enjoyed a gourmet lunch they had long been planning, and another group explored the Catacombs. Some also managed to sneak some shopping in, though not enough, according to a few! The day ended with a nice dinner at a tiny restaurant overlooking Notre Dame, with a stop by a creperie on the way home. Still in Paris, our group of students and chaperones spent most of the third day walking the streets. The morning started with a brisk walk from the hotel to the Louvre, where students viewed the Mona Lisa, among countless other pieces. From the Louvre, the group walked to the Champs-Elysees for lunch and a little shopping. 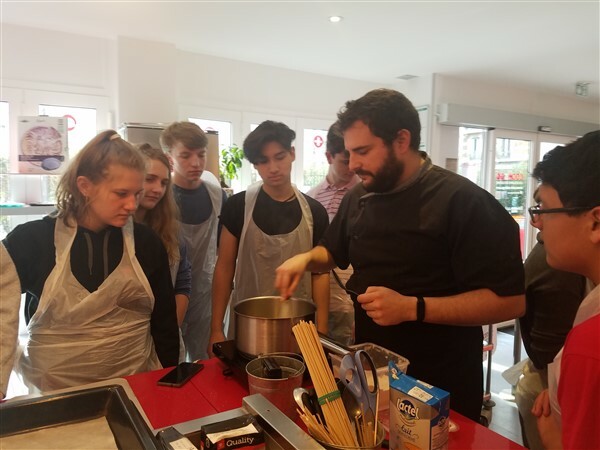 A cooking class followed, where students learned how to make croque monsieurs and ratatouille. They then hiked up the hill to the bohemian neighborhood of Montmartre where they toured the Sacre-Coeur basilica. 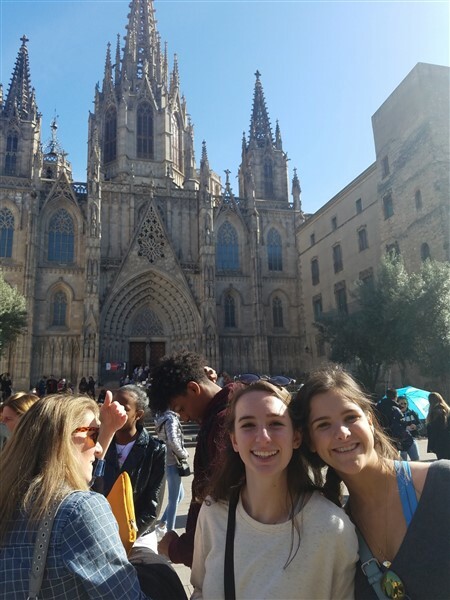 Arriving in Barcelona, our students and chaperones dropped off their bags at the hotel and made for the Gothic Quarter, where students lunched at a local café or a kiosk at the Santa Caterina Market, toured the Cathedral of Barcelona, and wandered the narrow, shop-lined streets around the cathedral. 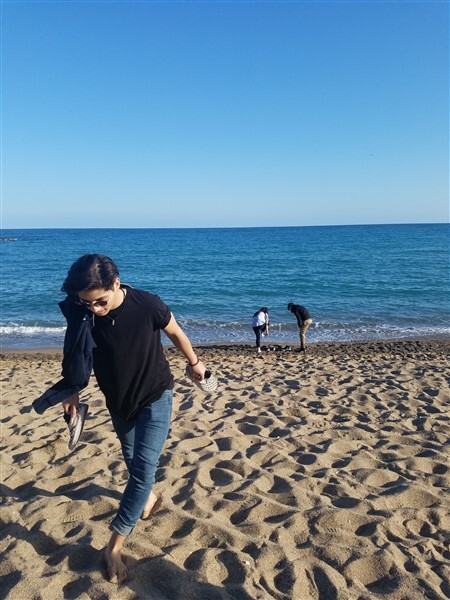 Then, they toured Barcelona by bike, seeing the Arco de Triunfo, Parliament, the Citadel, some Olympics-related sites, and everyone’s favorite stop – the beach. That night, the group dined at a cute bistro called Bosco and wandered the streets of Barcelona, stopping at a gelateria along the way. The group started their day with Mass at the Cathedral of Barcelona in observance of Ash Wednesday. The celebrant told Mrs. Askins afterward how delighted he was to see a group of young students in attendance at his morning Mass. On the following tour bus, they saw historic landmarks and neighborhoods along the way to Parc Guell, a failed 19th century housing development converted into a gorgeous, curious public park. The tour ended at Sagrada Familia, the towering and breathtaking basilica in the heart of Barcelona still under construction since 1882. After lunch, students split into two groups: one group toured the Roman ruins at the Barcelona History Museum, and the other group toured Barcelona’s Picasso museum. They closed the evening with a tapas dinner, hopping from restaurant to restaurant to restaurant to sample small plates. Traveling to Madrid by train, the group grabbed lunch on the Gran Via after checking into the hotel. After lunch, our students took a bus tour of Madrid, ending with a guided tour through the Museo del Prado, Spain’s national art museum housing pieces by El Greco, Velasquez, Bosch, and others. 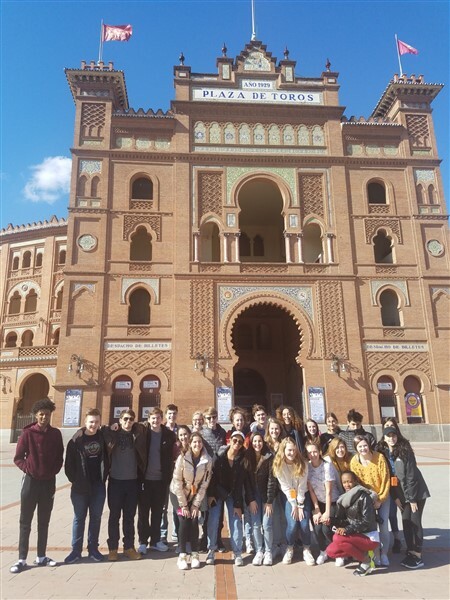 For dinner, students enjoyed paella and closed the evening with a guided, walking tour, passing monuments like the Plaza Mayor and the Royal Palace. The group enjoyed some churros and hot chocolate before heading back to the hotel. On the final day of the trip, the chaperones were nice enough to let students sleep in a litte before leaving to tour Madrid’s Reina Sofia, a former monastery converted into a museum of modern art. Afterwards, students explored Retiro Park, Madrid’s largest public park. 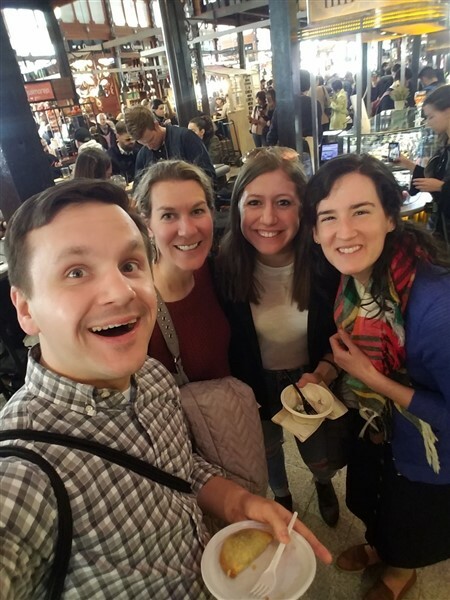 There, they reunited not only with Beth Van de Voorde, now serving in Madrid, but HSP alum Stephanie Perez, who happens to be studying abroad there this semester! The group stopped for lunch at Plaza Mayor and San Miguel Market. After lunch, we split into two groups: one toured the Royal Palace, the other opted to spend their last afternoon on the continent shopping. They ended their night with an Italian dinner - veggie pasta for a Lenten Friday - and one last cup of ice cream before returning to the hotel.